SAN DIEGO -- In a time when most golf courses are lined with homes, and fairways are flanked by neighborhoods, it's a simple pleasure to play a layout absent of any dwellings. The Crossings at Carlsbad blends seamlessly into the hillside terrain. 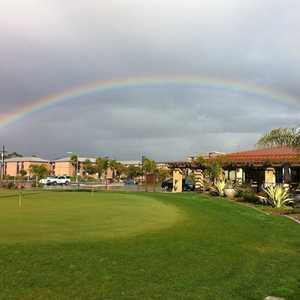 Especially in bustling southern California: The lure of the home-free golf course often beckons golfers looking for a five-hour getaway from it all, yet is elusive in an area packed with freeways, office buildings and miles of residences. The San Diego area, however, offers several golf courses without real estate, ranging from the nation's golf manufacturing capital -- Carlsbad -- down to Chula Vista, just 15 minutes north of the Mexican border. 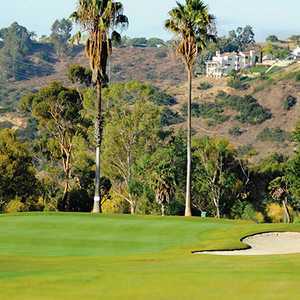 So whether golfers are looking for an idyllic round in nature or (many times more importantly) fewer houses to hit with errant drives and approaches, a sampling is available spanning the gamut of San Diego's diverse terrains. The North County city of Carlsbad is known for its ocean breezes, variety of vistas, and well-planned communities that maximize the natural surroundings while minimizing visually obtrusive buildings. So when The Crossings at Carlsbad opened in 2007, owned and operated by the City of Carlsbad, there was little surprise that the municipal course blended seamlessly into the hillside terrain while offering golfers and non-golfers an outlet for hiking, dining and rounds. Intricate thought went into the planning of The Crossings, a 6,835-yard layout with several panoramic ocean views that spreads across more than 400 acres of coastal landscape. "It's very unusual to have a golf course built within the last four years with open space surrounding the entire course, especially along the coast in southern California," said Jeff Perry, general manager of The Crossings. "Even though The Crossings is located in the highly populated area of North County San Diego, it gives players a unique feel of being isolated from the 'real' world -- you feel like you are not in a city at all." The course's name is derived from the five "crossings" (bridges) that designer Greg Nash brought into the course to meet the land's topographic and environmental conditions, such as wetlands and wildlife. Nash worked with the City since the early 1990s to bring the course to life, taking into consideration the many present environmental sensitivities only a mile inland from the Pacific Ocean. "It's nice to come up from downtown (San Diego), spend a round in the peace and quiet, but be so close to civilization," said John Brown, a Crossings patron -- and 11 handicap -- from San Diego. "It eases the mind and nerves a little to play a layout without the obtrusiveness of homes, since houses and golf courses seem to go hand in hand these days." What's one of the benefits of a houseless course in an active community like Carlsbad? Even those who don't play golf can still enjoy the course surroundings while walking along The Crossings Trail, a three-mile long path that links into the Carlsbad Trail System. Many head for The Crossings' Canyons Restaurant in the 28,000-square-foot clubhouse for a quick bite after a hike or round. It's difficult to not take a deep, cleansing breath when standing on the first tee of Barona Creek Golf Club. It's arguably one of the most silent courses in southern California, and -- on tribal land owned and operated by the Barona Band of Mission Indians at Barona Resort & Casino -- the course is sprawling, open and void of dwellings. An ideal combination for a memorable round. Orange County's Todd Eckenrode crafted the layout under Gary Roger Baird Design International, pulling in pieces of Scotland and other inspirations to create a rolling layout reflective of the natural terrain. More than 100 bunkers are strategically scattered throughout, and along with natural long grasses and the course's iconic old oak tree that splits the first fairway, offers lots of unforced challenge. "There's something about being out here, looking around and not seeing anything but nature that's really relaxing," said Jim Sutherland, a 9 handicap from Canada. San Diego's rocky mountain ranges hover in the distance of Barona, and along with the course's attention to water practices and the environment, Barona Creek is one of the few courses in the state designated as an Audubon International Certified Sanctuary. All of this combined has earned Barona Creek Golf Club numerous awards since it opened in 2002, including three from Golfweek in 2010 alone: the No. 4 Best Course You Can Play in California, No. 5 Best Casino Course in the Country and No. 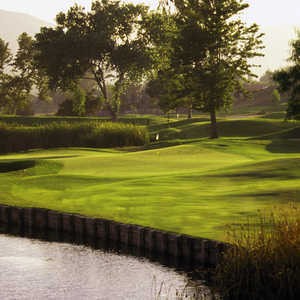 11 Best Tour Course in the Country for its hosting of the Nationwide Tour Championship. John Cook and San Diego-based architect Cary Bickler designed Salt Creek Golf Club as the then-known Auld Course, considered the only links-style golf course in the area. It is set next to a California state wildlife preserve, which keeps home construction at bay and open vistas abundant. In the shadows of Mt. Miguel, nearly 80 bunkers and three lakes spot the 6,889-yard course, with views all the way to Mexico featured from elevated parts of the course. The first tee offers a panorama of the rolling layout; the par-4 ninth hole alone has a 150-foot elevation from the bottom of the fairway to green. Salt Creek is known by frequent players and discovered by visitors as a course sporting very diverse lies and shots. Doglegs, uphill and downhill holes are mixed with a wide range of yardages, and in the spirit of links, they are nearly devoid of trees. It is also home to one of the most comprehensive practice facilities in San Diego: a two-tiered, all-grass driving range spread across 25 acres allow players to hone in their shots, while two practice putting greens, chipping greens and bunkers help shave off strokes. A past editor and publisher of FORE Magazine, Katie Denbo is PR and Marketing Manager for the Pebble Beach Company. She is a member of the Golf Writers Association of America and the California Golf Writers and Broadcasters Association, and has traveled to golf resorts and properties all over the western U.S and Canada. Follow her on Twitter at @kdenbo. Thanks, Katie, for the positive press about the Crossings. Too bad the North County rags and citizens of Carlsbad can't appreciate the marvelous resource they have that is a buffer to the endless sprawl of housing and convenience shopping mini malls that has become Carlsbad. The Crossings is something for all to enjoy - not just golfers - and a blessing in disguise. Isn't that the kind of quality of life many have sought to embrace in North County?